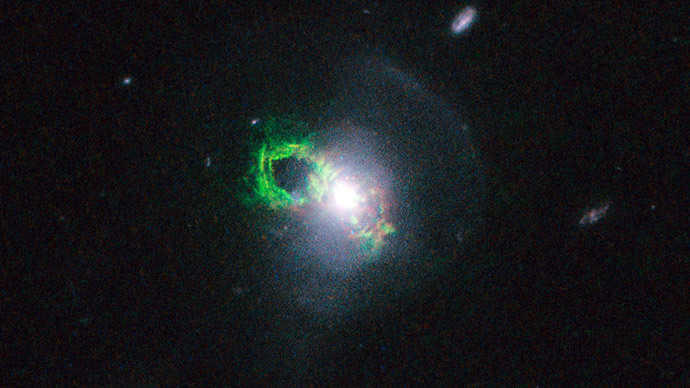 Hubble Space Telescope has discovered manifestations from the remote past, bright streams of gas, which look like immense looped objects glowing green, once ionized by quasars that no longer exist. The telescope, which will turn 25 in 20 days, has taken photos of eight unusual space objects glowing emerald in the depths of space. Light emitting space areas dubbed ‘Hanny’s Voorwerp’ are tens of thousands of light years across. The first object of this kind was spotted by Dutch schoolteacher Hanny van Arkel in 2007: she was participating in the online Galaxy Zoo project when volunteers helped to classify over a million galaxies catalogued in the Sloan Digital Sky Survey (SDSS). The ghostly structure was named Hanny’s Voorwerp (‘Hanny’s object’ in Dutch). 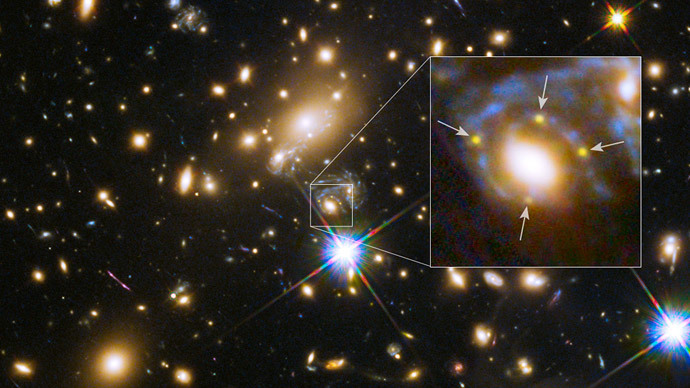 Hanny’s Voorwerp is a rare phenomenon that comes to life when a quasar, a compact and extremely bright region surrounding a supermassive black hole at the center of a galaxy, begins to emanate tremendous doses of radiation. A merger of two galaxies could create this phenomenon as well, when counteracting gravitational forces from two black holes rip apart stars and planets, creating huge clouds of space dust and debris. While the black hole “eats” matter, the material it devours grows hotter and the quasar throws out terrific jets of energy in two opposite directions, on both sides of the black hole. These streams of radiation make regions in deep space filled with invisible gases and elements glow through a process called photoionization. 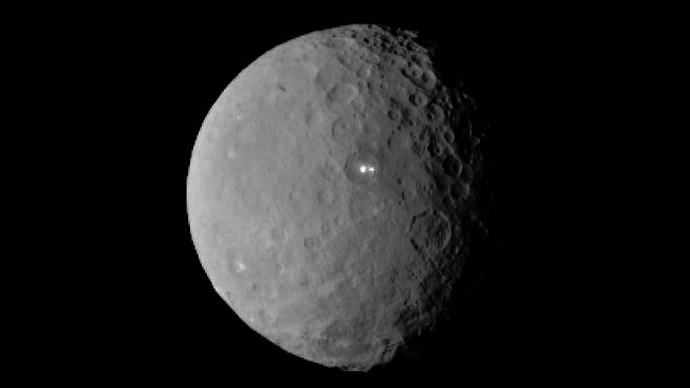 The green color means that the source of the glow is photoionized oxygen. 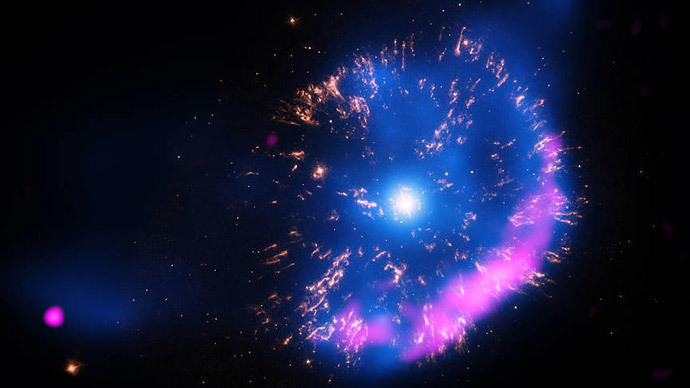 Filaments of helium, neon, nitrogen, oxygen or sulphur could emit absorbed light for thousands of years, when the quasar itself is effectively dead and dark. But eventually the darkness of space engulfs them, too. It would have taken light from the quasar tens of thousands of years to reach them and light them up. The green clouds will continue to glow for much longer before they fade, though the quasars themselves have turned off. Following the discovery of the very first Hanny’s Voorwerp, a spin-off project of the Galaxy Zoo project, involving 200 volunteers, examined over 16,000 galaxy images in the SDSS and identified 20 similar cloud objects.